In order to use D3 with React Native ART, you first need to link your project with the ART library. React ships with ART, but does not include all of its dependencies due to size considerations. To start, we will set up a Surface. This ART component will render the SVG path data created by D3. Unlike D3 rendered in a web browser, D3 in React Native does not have access to a DOM, and therefore cannot produce visual representations by injecting <svg> elements into other elements. The ART Surface component bridges this gap by creating a space for D3 SVG data to be rendered. I will use the following data to create the donut chart; feel free to use any other data, as long as it’s in an array. The original data is still there, but is nested in a data property. Several new properties that contain angle information have been added. Next, we need to generate an SVG path that we can pass to our Surface component. We will do this via the d3.arc() function, which creates an SVG path based on the chart’s height and width. We now have the angles for each of the elements of our data, and a path function that can map these angles to a circular path with a specific radius. The donut chart will be produced by mapping over the angles with the path function. Notice that the x and y attributes for the Group component are our previously-defined width and height divided by two. We need to specify these coordinates because paths created via d3.arc() are centered by default on coordinates (0,0). If our donut chart is centered on (0, 0), only a quarter of it will be visible. 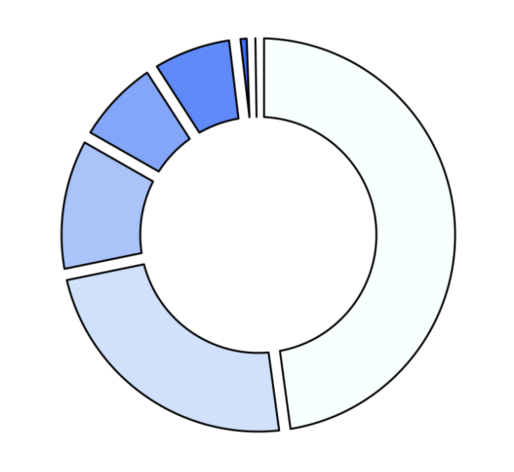 By specifying the x and y coordinates of the Group component to be width/2 and height/2 respectively, we are centering the donut chart in the center of our Surface component. You should now have a basic donut chart in your React Native app. If you are interested in adding data labels, I would recommend checking out the d3 centroid method. I hope that this tutorial helped you integrate D3 into your React Native app!